In the last week of Lent before Easter, Christians all over the planet observe and celebrate the death and resurrection of Christ with elaborate rituals dating back over the centuries. No more so than in the south western state of Kerala, India. Every visitor to the region over this period will have witnessed the dramatic sight of thousands of pilgrims walking extensive distances to various religious destinations, lining the roads and country lanes in their tens of thousands. 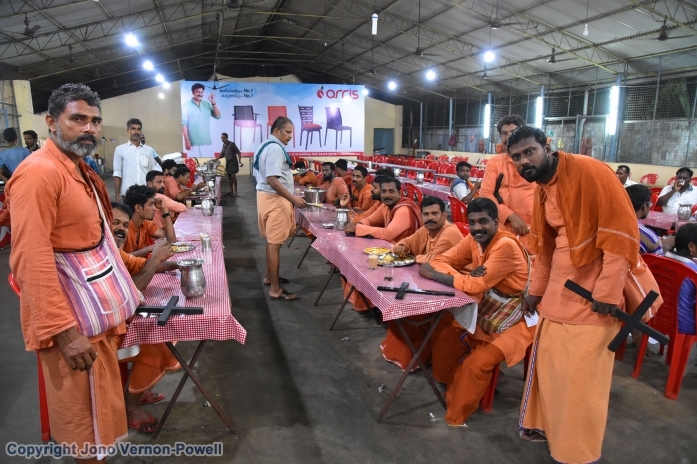 One of the most impressive is the gathering of the faithful at St. Thomas Church on the hill of the Holy Cross, Kurisumudi, near the village of Malayattoor on the banks of the Periyar River. St Thomas, one of Jesus Christ’s apostles, escaped persecution in AD 52 by fleeing to the top of this hill, where he prayed to the Lord and made the sign of the cross on a rock. A cross which, legend would have it, was subsequently found by hunters, who on smashing it with crude weapons witnessed a torrent of blood from within. The hunters returned to the valley and reported this, inspiring many successive visitors, some of whom are said to have witnessed further miracles. 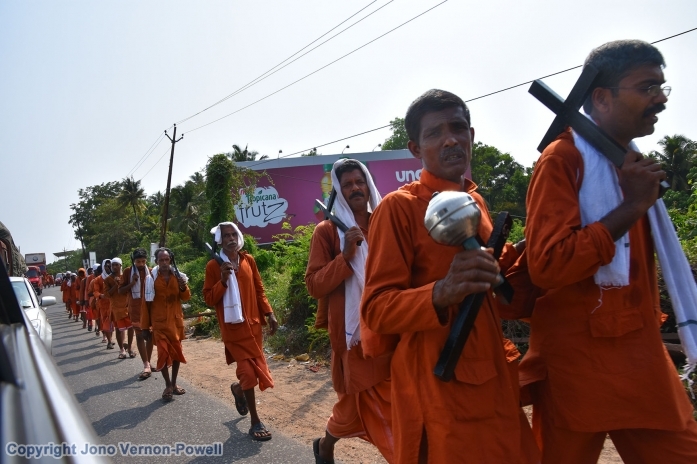 This in turn has galvanised a steady stream of believers to embark on the pilgrimage to Kurisumudi ever since. Holy week in particular witnesses an enormous gathering of pilgrims that have in many cases trekked for days and even weeks to get there. Lining the roads from all directions they walk through the fierce south Indian heat to the Church of Malayattoor, where finally they can refresh themselves in the river, and eat and rest before their final ascent to Kurisumudi. 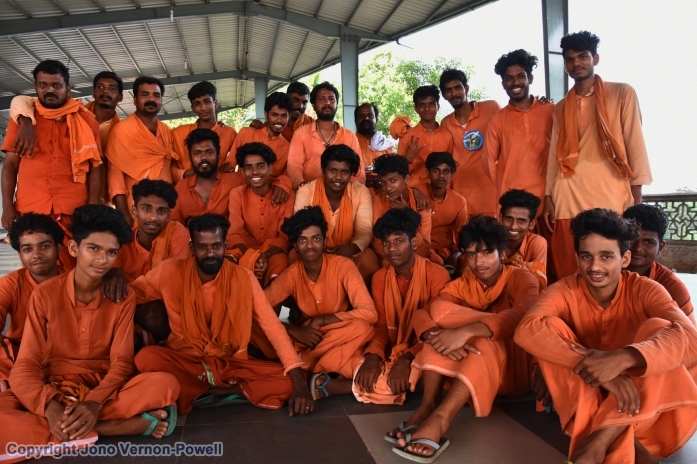 It’s a pilgrimage that takes on significance for countless groups of young men who undertake to walk huge distances from their home towns together, dressed in orange or black robes and carrying wooden crosses and their meagre belongings. It is a spectacle I found inspiring for its persistence and heart-warming for its overall feeling of collectiveness. I experienced nothing but friendly convivial co-operation while trying to record the pilgrimage’s events at the church, river and hill of the Holy Cross. Priests and pilgrims alike were approachable, gregarious and hospitable. I believe these photos taken during Holy Week show the range of emotions. In addition to exhaustion on the faces of the pilgrims, you can see their obvious and inspiring joy at having reached their destination.